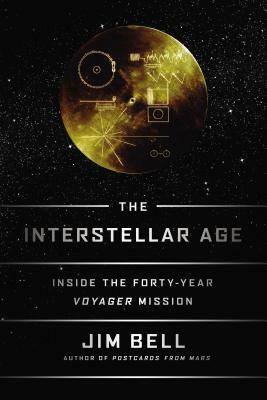 Thank you to the publishers at Dutton for sending a copy of The Interstellar Age: The Story Of The NASA Men And Women Who Flew The Forty-Year Voyager Mission. I just finished the book last night, and was pondering my overall rating. Was it a page burner? Not in the traditional sense – 3 stars. Was it boring? Not at all. 4 stars. Did it get into all of the technical details of the spacecrafts? Not as much as I might have liked – 3 stars. Thanks to the unassuming writing and musings of author Jim Bell, I now know more about space exploration than I had ever anticipated. I now know about the Voyager missions. I know about the New Horizons launch in 2006. I know about the importance of a gravity assist. I know that when Neptune was first discovered in 1846, the size of the solar system was roughly doubled. I know that an IAU is roughly 93 million miles, what was included on the Golden Record, the fact that it takes Neptune 165 Earth-years to travel around the sun, when they’re expecting Voyagers I & II to stop communicating, and the unfortunate truth that NASA constantly struggles to secure government funding for the continued exploration of all things beyond our atmosphere. For heaven’s sake – I even know what a heliopause is. That settles it. 4 stars for The Interstellar Age, with sincere thanks to author Jim Bell for taking the time to write such a fact-filled tribute to this country’s space exploration program. Even if you don’t know much about it (and I didn’t), this is a wonderful introduction to the subject. If I was a science teacher who was charged with teaching my students about space, this would be required reading. What seems to disappoint some of the readers of this book is the fact that it’s not overly-technical. It’s not a behind-the-scenes summary of the mechanics of the spacecrafts. The pages are not filled with minute details of what plugs into what, or how the engineers and scientists drew up the blueprints. This book is a humble, and humbling account of the Voyager missions and their discoveries. It’s about the photographs. It’s about the devotion of the scientists. It’s about the discovery of rings around planets, escape trajectories, the importance of finding volcanic activity on distant moons and how to snap a clear picture when your spacecraft is travelling over 35,000 miles an hour. Once you close The Interstellar Age, you’ll understand all of this in surprising detail. One of the successes of Jim Bell’s book is how he shares his knowledge. He doesn’t talk down to the reader, and he doesn’t speak in scientific jargon. It quickly becomes evident that he must be pretty fantastic at his current job, which is professor in the School of Earth and Space Exploration at Arizona State University. He uses his personal experience with NASA’s space exploration program and happily shares everything he learned. His enthusiasm for the program is unbridled, and his excitement to share everything practically leaps from the pages. The truth of the matter is that this is a challenging review to write, because I want keep sharing more facts with you. It’s exciting to know that there are phenomena outside our world that we cannot explain, and those that we can. Knowing that there is a team of brilliant scientists who continue to study the depths of space is absolutely inspiring. What struck me as I was reading the details of these missions was that there is still so much to learn. Each discovery made by NASA’s scientists, orbital dynamics engineers, astrophysicists and geologists leads to more questions. It’s a dizzying and never-ending cycle of learning. After reading this, what I am most thankful for is the devotion of NASA’s teams. Their ingenuity and intelligence are rivaled only by their almost giddy enthusiasm for the project. Their discoveries benefit everyone. If you saw the condition of my book, it looks like it’s been loved. It’s full of notes in the margins, highlights, dog-ears and little scraps of paper that contain profound discoveries. I usually take meticulous care of my books, but this one looks a little beaten. And this is a good thing. Because although this book is not your typical page burner, it is a wonderfully important read. When you close the book, your mind will be swimming with knowledge and questions in equal measure. This is also a good thing. I wonder how many young people will consider a career in space exploration after reading Jim Bell’s accounts. My bet is that there will be many. 4 impressed stars for The Interstellar Age.